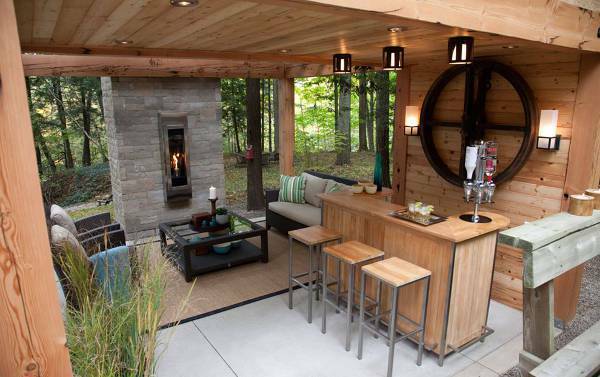 Bring a touch of luxury to your outdoor space by adding a modern bar. Place it closer to the pool so that after swimming or sunbathing you can quickly get access to your drinks. These bars tend to be all weather resistant. 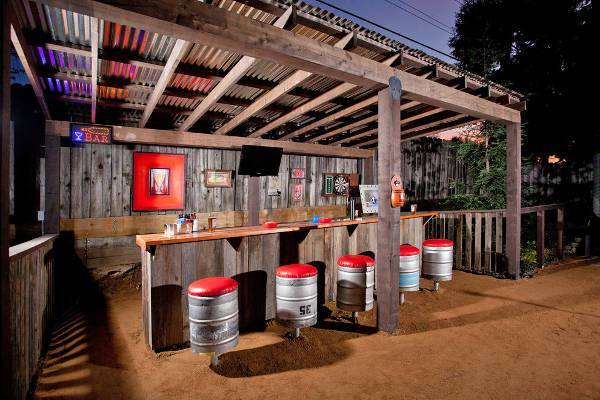 It is not uncommon to see wooden furniture in DIY outdoor bar designs. They add an interesting ambiance to space and help show a person’s creativity and love for recycled materials. A table made from wine barrels is cool and shows unique style. Do you want a unique bar? 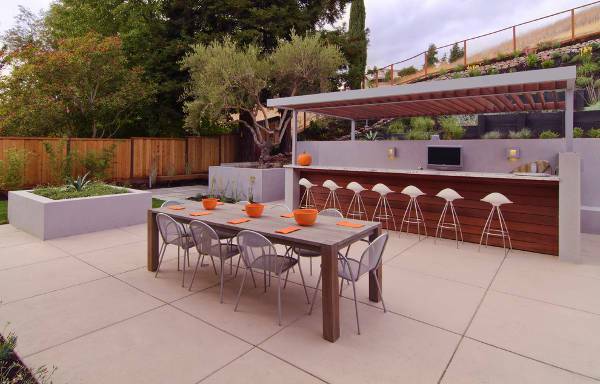 Then go for concrete outdoor bar designs. 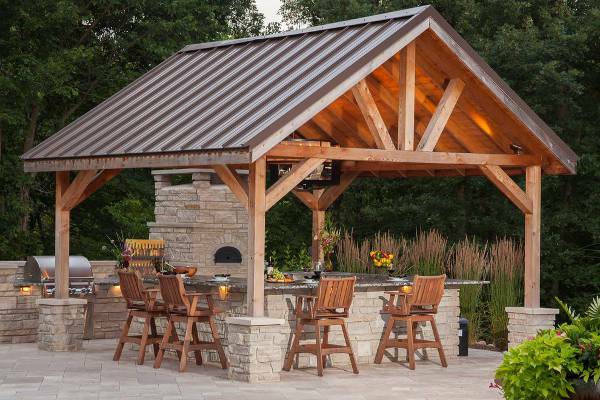 They have an organic look that will easily complement the outdoor environment. They come in different finishes and concrete is naturally weatherproof hence ideal as an outdoor item. 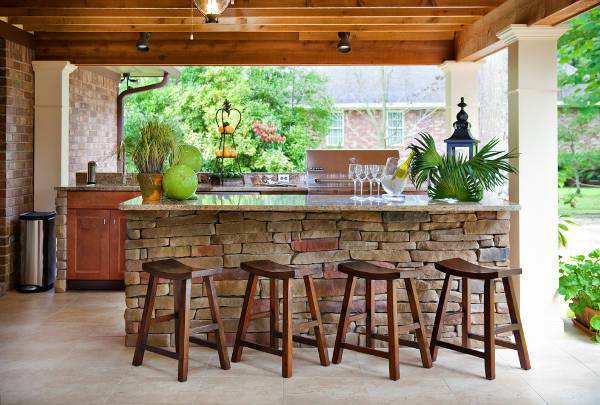 Outdoor patio bars are the perfect place for showing off your cocktail mixing skills. 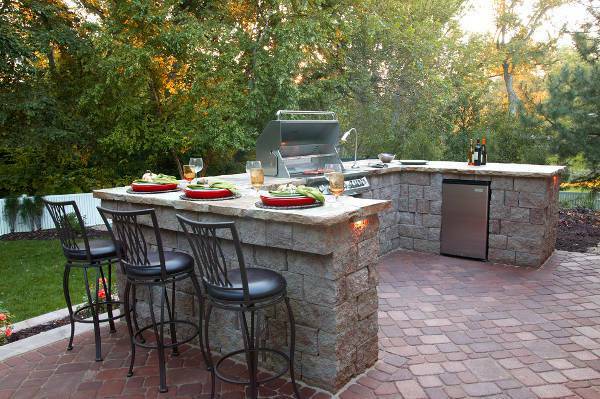 If your patio is large then when remodeling add sinks for washing the glasses and a refrigerator for keeping your drinks at the right chilled temperature. 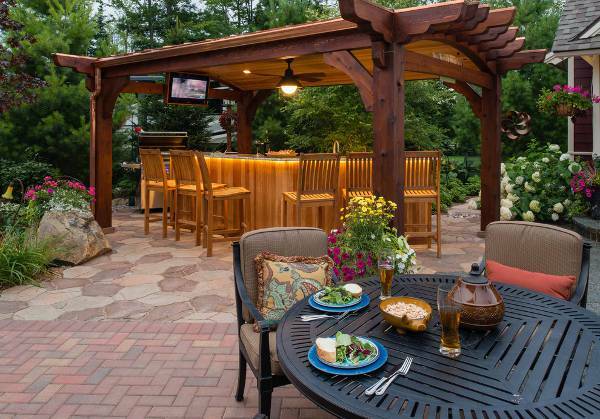 If your backyard has a garden, then integrating an outdoor bar can help more people appreciate the beauty of that garden. 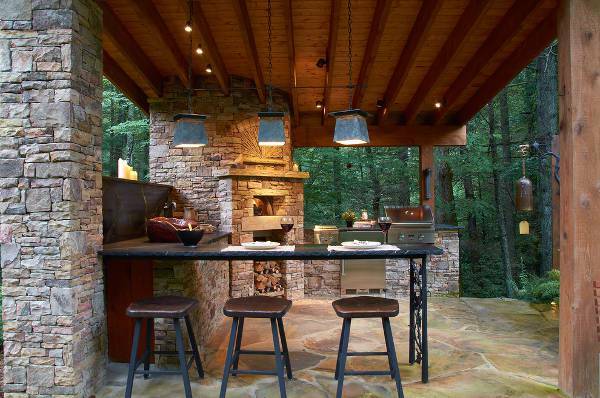 Opt for wood bar designs that will match the outdoor scenery. 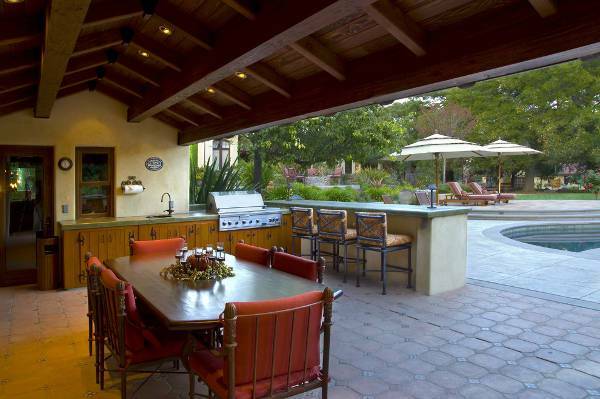 Outdoor pool bar designs can be the ideal place to entertain family and guests. The ambiance of the pool will make the bar a focal point for enjoying good food and drinks. 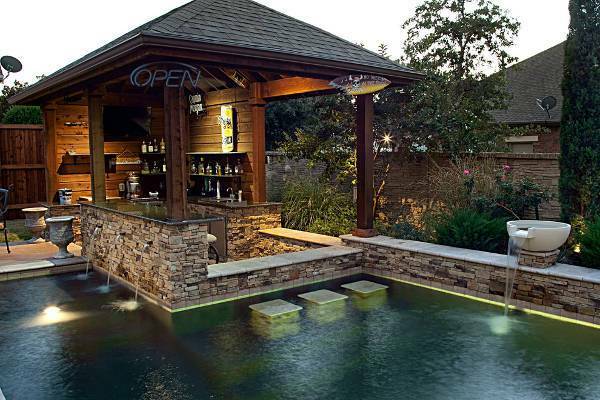 The best pool bar will complement outdoor surroundings. U-shaped bar designs function to provide ample space to mix drinks and socialize. While they tend to suit luxurious settings you can maximize the space of the U-design by turning the tail of this shape into an outdoor kitchen. These designs have minimum cleanup hence are perfect for integrating a card or board game. 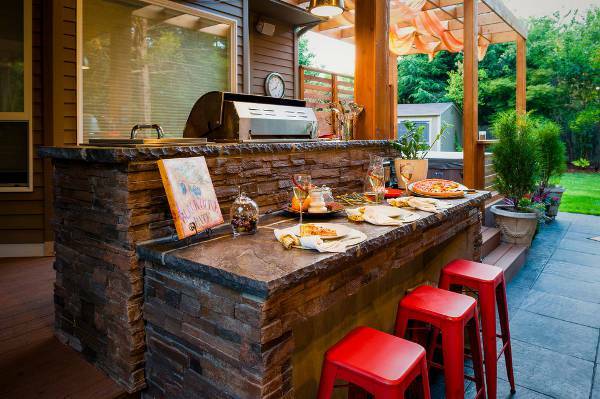 The wet bar outdoor design differs from a regular home bar as it features a sink which guests and family members can use to wash their hands or to maintain the general hygiene of the space. The floor is sloped towards the drainage area. It is also equipped with refrigerator or ice maker. 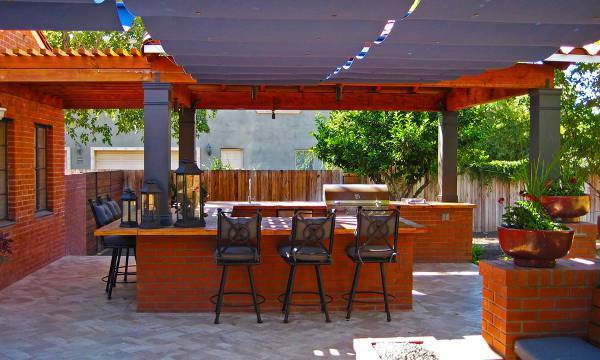 Brick bar designs are the popular choice for most outdoor spaces as they are durable and have that authentic natural look. 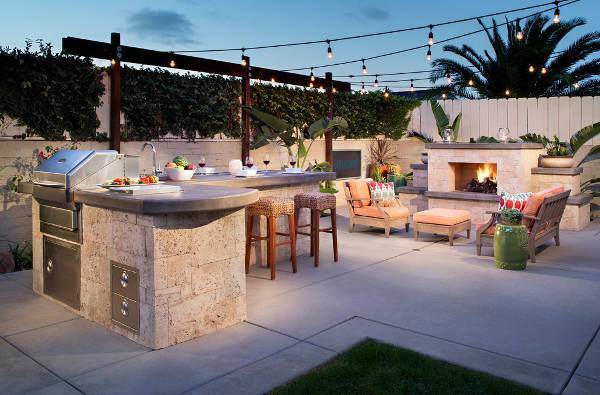 Brick is a noncombustible natural material hence makes an excellent choice for outdoor bars especially those that include electrical wiring or kitchens. 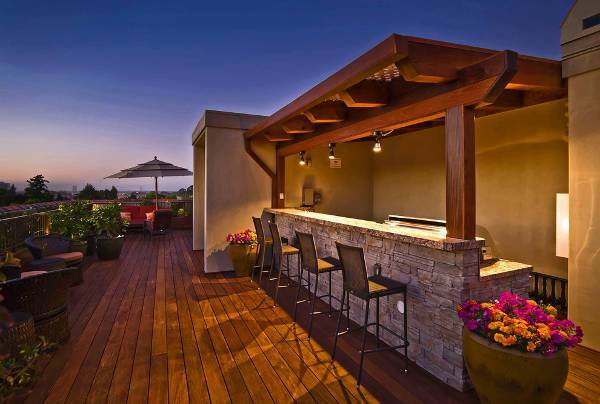 Whether you prefer a wet, drink cart or dry bar, outdoor deck bar designs can meet all your needs and lifestyle. Dry bars are economical and are ideal for hosting smaller crowds. Apart from allowing a smooth flow of drinks, a drink cart can be put aside to provide more floor space. 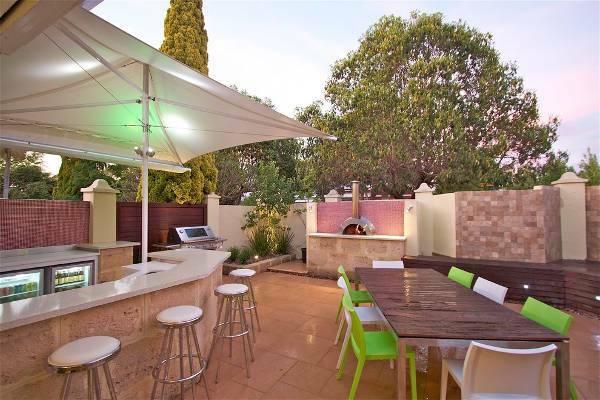 Outdoor bars are practical as indoor bars and work to make your life more comfortable and enjoyable. When choosing the bar chairs consider those made from materials which are durable and all weather without sacrificing comfort. Depending on your lifestyle you can choose from portable to permanent outdoor bars for serving both alcoholic and non-alcoholic beverages.